Energy is expensive here in Ontario! Electricity costs a lot more than in BC and we can’t get natural gas out in the country. 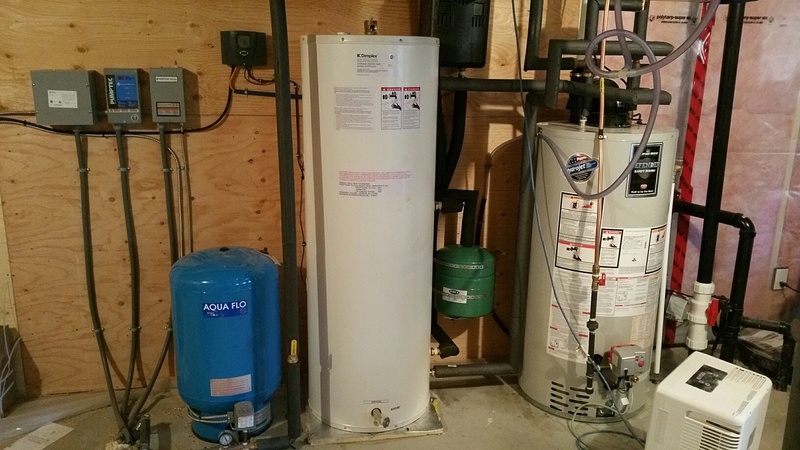 Both our furnace and hot water tank are powered by propane. In an attempt to keep our bills lower and to be good stewards of energy, we are using as much solar power as we can. We had considered having a solar electric generating system installed but, for several reasons, found it wouldn’t be feasible for us. But we did have a solar water heating system installed this past week. The solar panels are installed over the garage to take advantage of the south-east exposure. We had three panels installed to provide enough hot water when we have visitors. If you look closely (try double clicking the picture) you can see that the siding installation is not yet completed above the garage door. 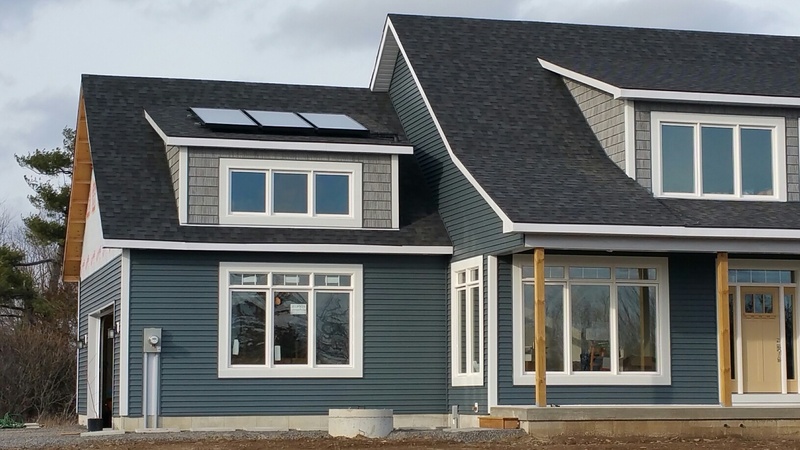 The installers ran out of siding and it is back-ordered until sometime after Christmas. Also the eave troughs and some of the soffits still need to be installed. We are not sure when the pillars on the porch will be completed. The solar heated tank is the tall one in the middle. When it is sunny, or partly sunny, the sun warms glycol in the tubes in the solar panels on the roof. The pump runs the glycol-filled tubes through a heat exchanger in that tank and the water is warmed. The pre-warmed water then goes into the regular propane heated tank on the right. Some people have said that we won’t save much with this system while others that we have spoken to or have read what they wrote say that this is the most efficient and cost-effective way to use the sun’s energy in the house. We will have to wait and see, always hoping that the sun will shine! Finally, one of the most pleasant surprises of living in this house is how much the sun warms it on sunny days. True, we have not yet had any cold weather to speak of but even on cooler, sunny days we have not used the furnace or wood stove to heat the house until later in the day. The sun coming through the south-east and south-west facing windows has warmed the house to about 22 degree C and kept it there for most of the day. 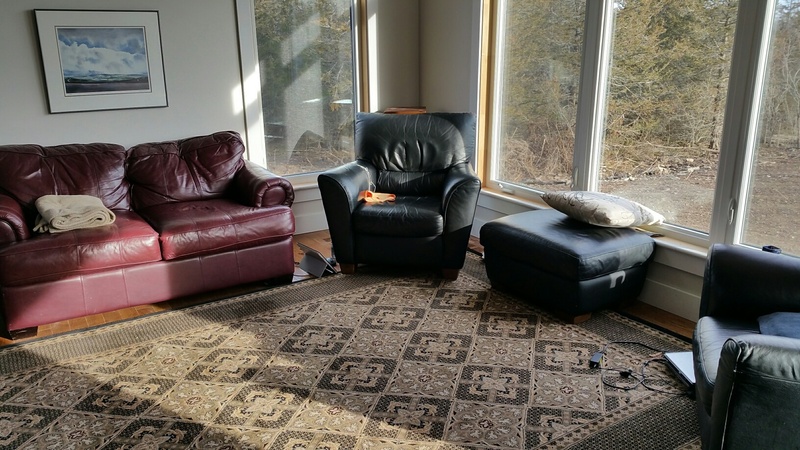 It is probably not too good for the rug or furniture but the sun streaming in the windows has been great for warmth. We still need to get blinds and paint the window trim but those will need to wait until after Christmas. Wishing you all a blessed Christmas and happy New Year! Thank you for sharing about your solar panels too. Moving Provinces is something like moving Countries…..so many small differences research does not touch . Love your glorious water supply, looks somewhat like a mountain lake and how brilliant that you decided to dig. Have a wonderful family filled Christmas in your new home, your new life. Very interesting to follow your blog. I wish you and Jonathan’s and Andrew’s families a blessed Christmas and a happy New Year as you make a home in your new house. It looks great; it must have been an awesome experience. I think of both of you often. All the best. Love, Margaret.